I began 2015 touting Mike Matheny’s ‘manifesto’ and I am going to do a do-over here in 2016 because it merits another look. The ‘Matheny Manifesto’ is the best thing to happen to youth baseball maybe in the history of of the game. Maybe the pendulum in youth baseball is swinging back to a more sensible, player development minded approach. (NOTE: Mike Matheny is currently the field manager for the St. Louis Cardinals). First, winning below high school varsity is really irrelevant. Now before you say, “But Dave”, hold your horses, don’t worry. I am as competitive at the next guy. I like to win. But, player development trumps winning. Developing a deep, healthy pitching staff, playing multiple positions, and conducting baseball practices where players get many reps (touches) trumps winning. Teaching the professional baseball hitting mindset trumps winning… (Coaches who encourage trying to get walks rather than swinging the bat). Players who do not develop into run producing offensive players, who can’t handle the ball (I call it playing ‘close’ to the ball--catching and throwing efficiently), and have a decent, accurate arm are going to drop off the baseball wagon (especially at age 13 & 14). There is nothing wrong with a kid that stops playing baseball--I just hope it is not from lack of good coaching. That is why I say winning is irrelevant—if we don’t develop kid’s skills its GAME-OVER and players never even reach high school baseball. Second, parents and spectators say nothing. That’s right, it’s okay just to be there. Loud verbalizing, cheering and coaching from the bleachers is detrimental to and adds needless pressure to young ballplayers. Let the coaches coach. Players can get very distracted and confused when spectators get overly involved in the games and become too vocal. Third, let the players play. Coach during practice and just manage the games like a pace car. Coaches should refrain from taking over and yelling before and after every play. 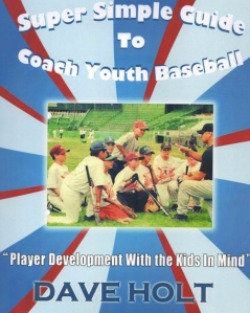 Try to do your coaching and teaching between innings in the privacy of the dugout. 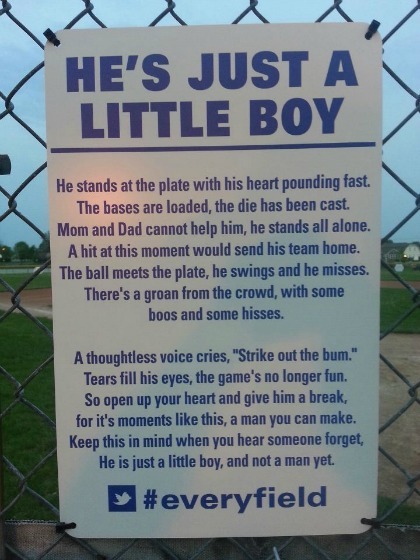 Nobody wants to play baseball and be told what to do every second of the game. Be enthusiastic and encouraging, but don’t over coach during games. Mike Matheny’s letter to parents has become the viral “Matheny Manifesto”. It has now turned into a full size book about Mike’s career. Every league and baseball organization without a doubt should have copies so everyone can have chance to read it. Right now this is our best hope to bring a sensible ‘player development approach’ back to our kids. My dad, Bert Holt, passed away last month at 82. Long time high school, junior college coach and professional baseball scout lost his battle with multiple myloma cancer in December. 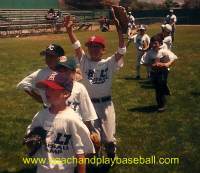 I caught the baseball itch at a very young age following my dad around as a coaches son. It was awesome. He had a tremendous passion for the game and teaching the fundamentals, and the necessary work ethic required to achieve success to his players. It was passed on to me, too. God be with you Dad. Thank you. Where is the player development? 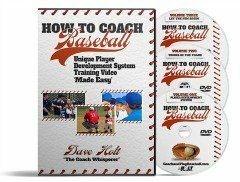 Free 4-Day Baseball Coaching Course EXTENDED to Jan. 30th.